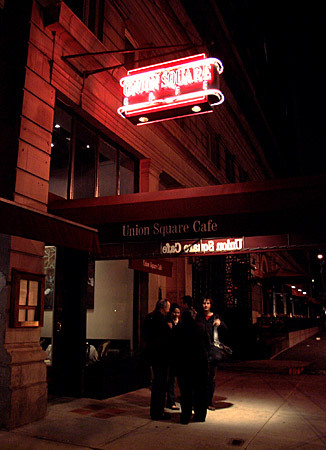 James, Angela, and I went to Union Square Cafe Sunday night. From the outside, it really does look like a small cafe. The interior is more spacious, though still cozy. Danny Meyer's restaurant, which opened in 1985, is a New York institution. We enjoyed both of the things it's famous for: chef Michael Romano's excellent New American/Tuscan cuisine, and the hospitality. Our appetizers were the butternut squash gnocchi and terrine of duck foie gras with pear/apple chutney. The butternut squash gnocchi were super, and the terrine of foie gras solid, but I wish they had seared foie gras instead. For entrees, I had crispy duck, James the herb-roasted baby lamb chops with garlic potatoes and mustard greens, and Angela the special entree, hangar steak with basil risotto and chanterelle mushrooms. The lamb chops really stood out. Cooked to medium-rare perfection, and those garlic potatoes just melted in our mouths. For dessert, James ordered butterscotch mousse, Angela the pumpkin upside down cake, and I the Baked Alaska. The wine list is both extensive and impressive. Our waiter, a very young guy, was extremely friendly and knowledgeable. I wonder, though, if the restaurant's hospitality would be as notable in another city. At restaurants of similar quality and price range ($9 to $16 for an appetizer, $24 to $30 for entrees, $8 to $10 for desserts), isn't top-notch service de rigueur? Or perhaps it's the warmth of the wait staff that's the novelty, not the service quality? Smiling, courteous waitstaff, a reliably solid meal--I can understand the restaurant's status as bedrock of the NY dining scene. The three of us decided to try and visit one expensive and renowned New York restaurant a month (if a restaurant is good and cheap, you can visit anytime). Any and all foodies are welcome. For November, perhaps we'll target one of the hot new eats in the Time Warner building.